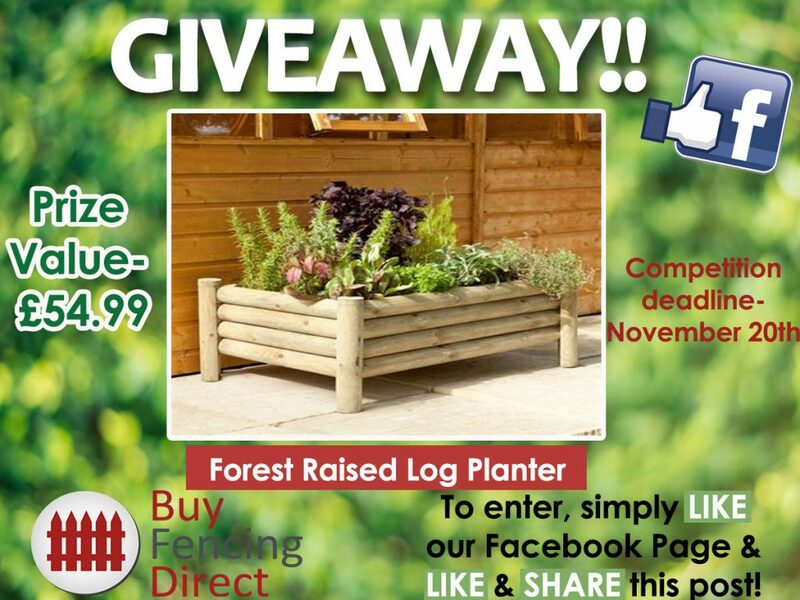 Here at Buy Fencing, we’re giving you the chance to win this beautiful Forest Raised Log Planter. With plenty of growth depth and area this garden planter is perfect for growing plants, vegetables and herbs. Constructed from half logs giving it an attractive appearance and when planted up it will create a stunning focal point for your garden. To be in with the chance of winning this Raised Log Planter, all you need to do is – ‘LIKE’ our Facebook page, ‘LIKE’ one of the competition posts and then ‘SHARE’ the post on your own wall for your friends to see. Deadline is November 20th at Midday and the winner will be announced the following day November 21st. With summer in full swing, we are enjoying spending more time in our gardens enjoying the sunshine. 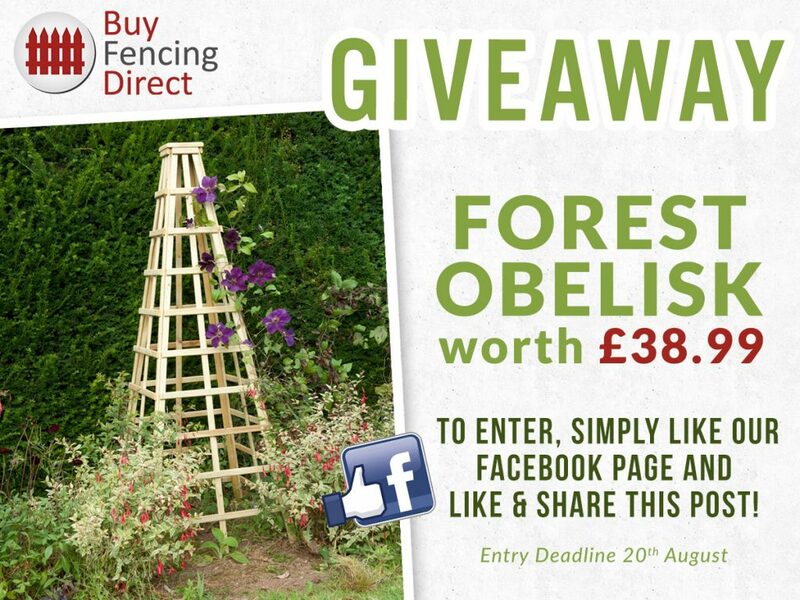 Here at Buy Fencing, we’re giving you the chance to win this Forest Obelisk. If you are fond of climbing plants then this obelisk is the perfect structure for your garden. The clever design provides the ideal support for climbing plants such as the clematis and climbing vegetables such as the sweet pea. A perfect prize and addition to any garden! To be in with the chance of winning this Forest Obelisk, all you need to do is – ‘LIKE’ our Facebook page, ‘LIKE’ one of the competition posts and then ‘SHARE’ the post on your own wall for your friends to see. 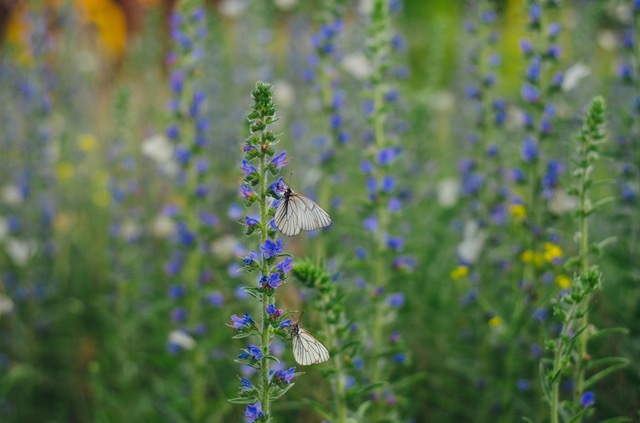 As summer is getting closer, we are well and truly ready to be spending more time outside in our gardens enjoying the sunshine but we are also thinking ahead for your yearly garden needs. 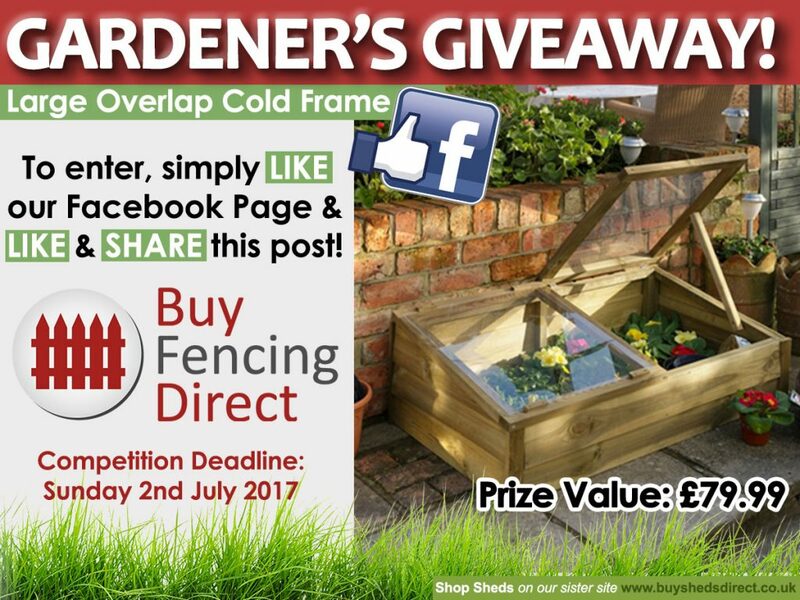 Here at Buy Fencing we’re giving you the chance to win this brilliant large overlap cold frame. The cold frame features two independently opening lids, with a timber prop to allow air circulation throughout the garden cold frames. A perfect addition to any British garden this year! To be in with the chance of winning these excellent set of three planters, all you need to do is – ‘LIKE’ our Facebook page, ‘LIKE’ one of the competition posts and then ‘SHARE’ the post on your own wall for your friends to see. It’s Spring GIVEAWAY TIME here at Buy Fencing Direct! To help get you into your garden this Spring we're giving away a classic Lindhurst Trellis Arch, which will make a perfect feature and statement in any garden. The fab Arch allows for climbing and trailing plants to grow up the structure, fitting into your garden perfectly. To be in with the chance of winning this excellent Trellis Arch, all you need to do is – ‘LIKE’ our Facebook page, ‘LIKE’ one of the competition posts and then ‘SHARE’ the post on your own wall for your friends to see. 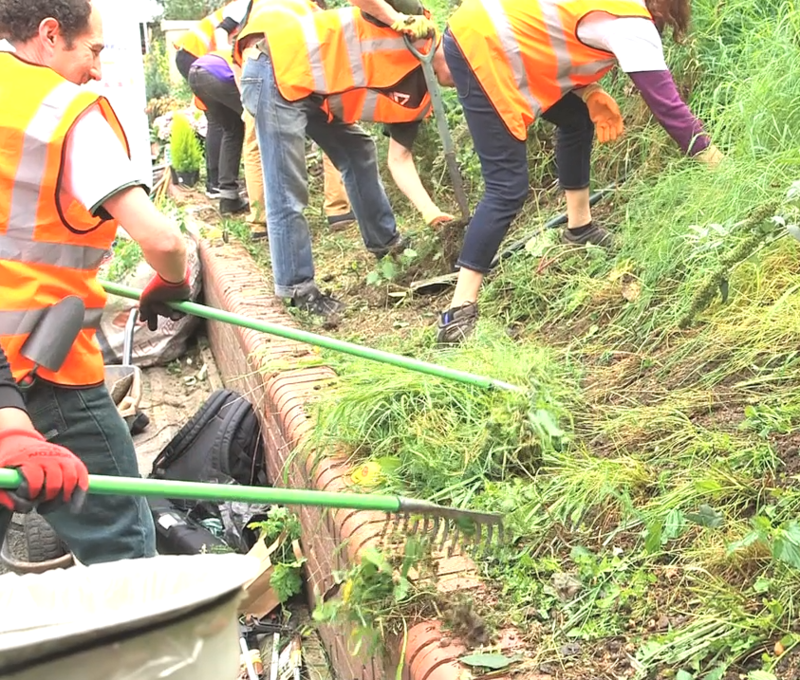 Earlier this month, we got back in touch with the lovely people at Freshwater Habitats Trust to get their advice on ponds before the summer months. 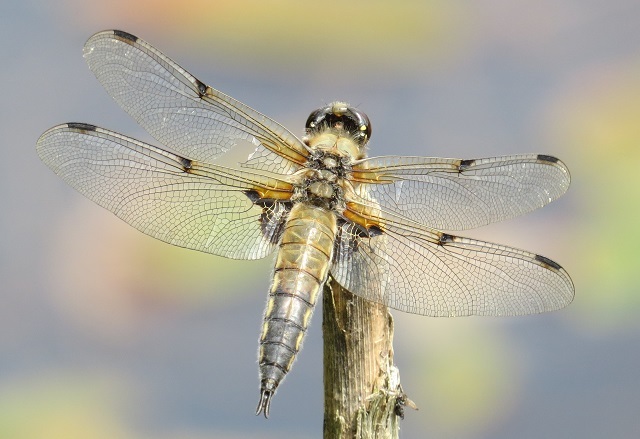 They tell us all about the different wildlife ponds can attract, how to create your own wildlife pond, and whether or not you should worry if water levels drop in your pond in our interview below. 1. What are some of the benefits of wildlife ponds? Wildlife ponds are fabulous places that can do much more than just offer a home for plants and animals. They bring so much pleasure to people and fascinate many a pond dipper, young and old. There are lots of situations where you need a little bit of extra height for your fence. But rather than taking a whole panel out and replacing with something taller, it may be more cost effective to add a little bit of trellis to the top of an existing fence. It will afford some added privacy and allow you to grow taller climbing plants. You should only fix trellis to sound fence panels - so always check for any signs of rot in panels and posts before attempting trellis projects. Trellis has an important job to do in the garden and has to look great at the same time. A trellis can extend the height of an existing fence panel or can be a standalone feature. Either way, it allows light to filter through and plants to grow up it. A simple square or diamond patterned trellis is popular but ever increasingly people are creating wave formations on top of their fences with decorative panels. Whatever you choose, do ensure it's a quality panel as you really don't want to be fixing it more than once in fifteen years (pressure treated wood carries that kind of guarantee against rot) and do ensure all fixings are galvanised so that rust marks won't ruin the look. With that sorted, you can get planning. What is the Best Fence for My Garden? Garden fencing has to both be practical and look great in the garden. And not just any garden – it has to be right for your own particular plot. 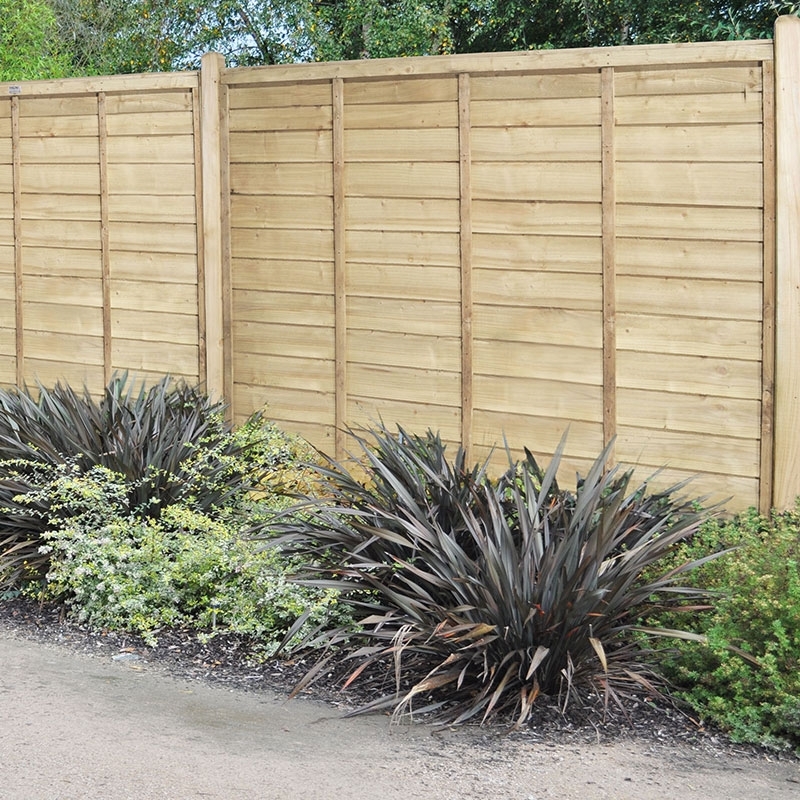 Most fences are used for screening - they might be hiding an ugly view, obscuring the neighbours, or acting as a barrier to unwanted attention, but this is not always the main motivating factor when choosing a fence panel. There are a huge variety of panels on the market, so let us guide you through the most popular types and whether they are likely to meet your own requirements.